Jay Thayer - SCI Technology, Inc.
Jay Thayer can’t say for sure it’s the exact same Weapons Processor. Then again, the coincidence is hard to ignore. Years ago, while Jay was on a mission with the 101st Airborne, the AH-64D Longbow attack helicopter he was piloting took enemy fire. When he came to work for SCI years later, Jay came across a Weapons Processor riddled with bullet holes. Coincidentally, it came from a helicopter flown by the 101st Airborne. “I can’t prove this, but based on timeframes that I got, there’s a very good chance that came off my bird,” Jay says. As you might expect, experiences like that uniquely equip Jay in his work as SCI’s Director of Business Development for Aircraft Systems. As a former United States Army Aviator, Jay possesses first-hand insight about how SCI’s products integrate with military aviation platforms to accomplish the war fighter’s mission. Before he was an Army Combat Aviator, Jay was a Marine. Growing up in Las Vegas, he dreamed of serving as a Recon Marine in Special Operations. So in 1993, he did just that. “Then I got there and loved it and it was cool, but I thought, ‘What am I going to do now?’” he says. About four years after enlisting, Jay started talking to Army Apache pilots who had gone through the transition process from one service to another. He then filled out the paperwork for an inter-service transfer, was picked up for flight school in 1999, and became a Warrant Officer in the Army. After the 9/11 attacks, Jay flew AH-64A helicopters for seven months before his unit was transferred to the AH-64D. 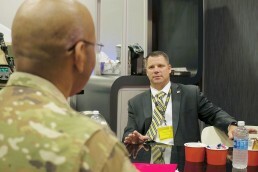 Following four total tours – two in Afghanistan and two in Iraq – Jay helped develop the curriculum for the Survival Evasion Resistance and Escape (SERE) School at Fort Rucker. The SERE program trains soldiers to survive when isolated from their unit, making them less vulnerable to the enemy. After heading to Colorado Springs with the 4th Infantry Division, Jay opted to retire with nearly 21 years of service time. When he came to SCI in 2016, he saw a workforce that didn’t appear to fully understand how their work impacted America’s war fighers. But thanks to the efforts of some fellow veterans, that has started to change.